This hands-on event will arm today’s HR and recruiting professionals with proven strategies, processes, and technologies to beat out the competition for top talent. BLR®—Business & Legal Resources, the leading provider of employment compliance, recruiting, and learning and development solutions and the publisher of Recruiting Daily Advisor e-newsletter, is traveling to Nashville, Tennessee, for its 3rd annual RecruitCon conference. The 3-day event features an all-new agenda, including intensive preconference workshops, learning labs, dynamic keynotes, and networking opportunities. RecruitCon will equip talent acquisition professionals with cutting-edge best practices to supercharge their acquisition efforts, as well as new technologies to streamline recruiting, the latest analytics to support evidence-based talent decisions, and so much more. Businesses often struggle with “time to fill,” which can cost $22,000 per position over the average period of 44 calendar days. RecruitCon provides use-them-now strategies for reducing time to fill, optimizing the job candidate experience, and so much more. The opening keynote speaker is John Hall, CEO of Influence & Co. and the best-selling author of Top of Mind. The Business Journal named Hall a top-100 visionary, and he was recently recognized by Forbes as a “must-see” speaker. Hall kicks off the main event discussing ways to naturally build trust with candidates and attract the best talent. Launching day 2 of the conference is Bob Kelleher, employee engagement expert, best-selling author, and international speaker. Kelleher’s keynote is titled You DON’T Have an Engagement Issue, You Have a HIRING Problem, and he will focus on hiring for the important behaviors and traits that define the organizational culture. In addition to intensive workshops, superior networking opportunities, and optional preconference sessions, RecruitCon 2018 takes place in the heart of downtown Nashville, named one of the hottest tourism spots of 2017. Recruiting Daily Advisor offers free webcasts, articles, and reports on topics important to recruiting and talent professionals. Its content comprises the most up-to-date best practices and technologies being used and tested in the workforce today. 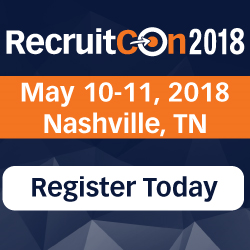 RecruitCon 2018 will be held at the Hilton Nashville Downtown in Nashville, Tennessee. For more information on attending or sponsoring the event, please visit http://live.blr.com/recruitcon. BLR®—Business & Legal Resources helps U.S. businesses simplify compliance with state and federal legal requirements and helps them become more successful. It does this by offering authoritative content and practical, easy-to-use tools. Through their expert in-house editors and exclusive attorney network, the company provides the most comprehensive, reliable, state-specific information available—and does it in all 50 states. Its award-winning information products—including training programs, events, Web portals, reports, and subscription services—give businesses of all sizes and industries the best tools available at affordable prices. Connect with the organization at https://www.linkedin.com/company/blr.